This image is one of Cassini's last views of Saturn from a distance, taken Oct. 28, 2016, before it headed in for a series of close orbits. Here, the probe is 870,000 miles (1.4 million km) from the ringed planet. Saturn's moons Enceladus and Tethys line up above Saturn's rings in this 2015 photo from the Cassini spacecraft, which has been exploring Saturn's system since 2004. "The collaboration … between three space agencies and all these thousands of people on the ground … [to] put a probe onto Titan, capture signal on the way down, land it softly on the surface and play those images back — I still give myself goose bumps just seeing that first image," Maize said. The Cassini mission is a cooperative project between NASA, the European Space Agency (ESA) and the Italian Space Agency. "To actually see this plume of water vapor and waterized particles coming out of the south pole of a moon that's only 300 miles [480 kilometers] across was absolutely astonishing," Spilker said at the teleconference. 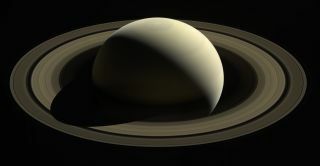 "And then to take instruments built for other purposes and turn them toward sampling and flying through the plumes and actually measuring the constituents — finding a salty global ocean containing organics, the possibility of hydrothermal vents and just revealing a world that we thought was completely frozen solid when we first got to Saturn."